Welcome to The California Tennis Network - built for the competitive tennis player. We are your source for tournament and league information in California. Advertise with the California Tennis Network for direct exposure to local tennis players. Send inquiries to PJ@californiatennis.com. We want to promote your tennis event! Invite our professional staff of writers and photographers and we'll bring your event to the web. Check out our Archives. LOS ANGELES - (August 1, 2010) As championship Sunday rolled around, both last year's singles and doubles winner's found themselves in a familiar position…the Farmers Classic finals. Weathering a first-set scare by the newly-teamed doubles pair of Eric Butorac and Jean-Julien Rojer, Bob and Mike Bryan rallied to claim their sixth title in L.A., including capturing a record 62nd title overall with a 6-7(6), 6-2, 10-7 victory. In singles, the No. 2 seed Sam Querrey dug deep to secure his second consecutive title in L.A. by defeated top-seeded Andy Murray 5-7, 7-6(2), 6-3. In the first match of the day, the Bryans were tested quite a bit more than they could have planned. Butorac and Rojer, former UCLA tennis players, were only playing in their first-ever event as a tandem, but already looking like a formidable opponent for the top doubles team. After capturing the first set in a tie-break, the Bryans, however, quickly turned the match around securing the second set. It was in the third set ten-point tiebreaker that the excitement began. The Bryans jumped out to a daunting 5-0 lead, before Butorac and Rojer got their first point. But within a blink of an eye the score was tied 7-7. After Butorac double faulted for an 8-7 Bryans lead, Bob crushed a few 130+ mph serves into the bodies of the opponents, allowing Mike to clean up at net. The title was a huge milestone, as the Bryans have now passed Hall of Famers Todd Woodbridge and Mark Woodforde of Australia, who hold 61 titles. "The Woodies put a record way out there. Sixty-one was Mount Everest when we started," Mike Bryan said. "We love what we do. To get this, one of their many records, is special." "We really looked up to the Woodies," Bob said. "They didn't have the power and big serves, but they had the poaching and the technique. To share this record with my brother is everything." Woodforde was on hand to congratulate the brothers. "For many, many years you've been traveling in elite company. Thanks to the victory today you're in rarefied air. You guys stand together as one," Woodforde said to the Bryans. "I know you two will continue for years to come. The floodgates will open entirely, so I know 70, 80 will come." Immediately after, it was overheard as a fan yelled "100", implying that a triple digit number is looming. 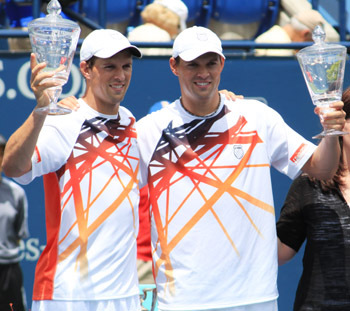 The victory for the Bryans coincidentally happened on the Birthday of the Hall of Fame legend Jack Kramer…The Bryans said after the match that they dedicated their victory in his memory. 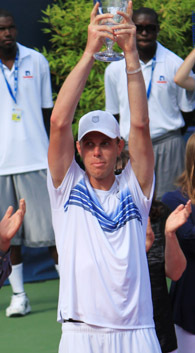 In the second match of the day, returning champ Sam Querrey fought off a match point in the second set to beat Murray for the first time in his career. The 22-year-old became the first player to repeat as singles champ since Agassi in 2001-02. "That's the highest-ranked guy I've ever beat," Querrey said. "I wasn't going to give it to him. I was going to make him come up with a shot to beat me." Murray was a last-minute entry into the tournament and it seemed a lack of conditioning might have played a roll towards the end. "I've got to be happy getting to the final and having chances to win," Murray said. "I didn't play my best tennis. Just tired." In the third set, Querrey went up 15-40, giving the American two chances to break…and when Murray dumped a feeble drop shot attempt into the net, the 4-2 advantage went to Sam, and he held serve from there. "I did a great job of being patient," Querrey said. "We were both tired at the end, but I just happened to be hitting my spots." Not only does the win give Querrey his fourth title of the year, but it vaults him to the top of the Olympus U.S. Open Series. Should he win the U.S. Open Series and win the U.S. Open, Querrey would be the recipient of a cool million dollars extra!! Good Luck Sam. GOT TEAM PHOTOS? Send in your team photos including names and details of those pictured. WANTED: Do you play USTA League or tournaments? If you would like to contribute articles or photos, we would like to post them. We are looking for current event news for So. Ca and No. Ca. Please call (818)343-8202 or email webmaster@californiatennis.com.